Today is a day to give "thanks". I feel very grateful to have a number of things to be thankful for. We will be gathering a little later, for a day with our children and grandchildren. This will be the first Thanksgiving were we will not be with relatives that travel from out of state to celebrate this holiday. In other words it will be quiet and laid back with only eleven instead of as many as forty. I love family, but I am thankful for the quieter time! If you take some time to spend reading this blog today, I will be extremely thankful! So on to this next design ... I decided to change things up a little with this wonderful die, designed by Eileen Hull. It's nice to design something for these "hops" that I can use or give away when it's done. For this week's idea what better subjects to use but those sweet grandchildren that I am extremely thankful for. The larger pieces from the die. I used the majority of the pieces cut from the die. 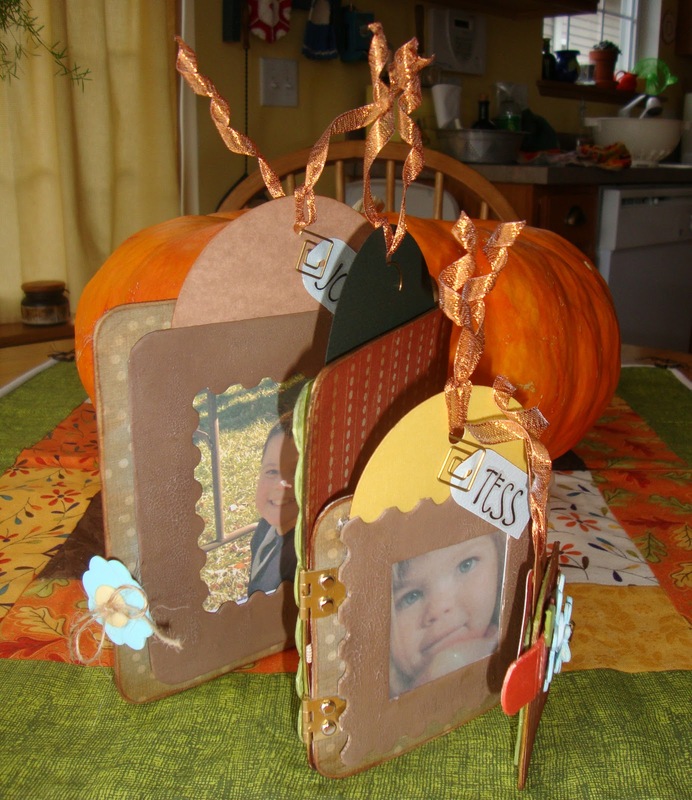 The smallest frame back is cut using and Original Sizzix square die. The middle two frame backs were cut from the mat board using an X-acto knife, then rounding the corners with a Crop-A-Dile Corner Chomper. Again I wanted to show a variety of ways to finish the pieces. This project used mainly papers, paints and inks. I apologize for the "bad" photos. The ink supply in the printer was very low on a couple colors and there was no time to get replacements today. (Busy with preparing several things for Thanksgiving dinner.) If time had allowed and if I had another set of the die-cuts, I would have added additional frames and photos to the opposite side of each square. Happy Thanksgiving all you readers ... I will be very thankful if you leave a comment! Love your use of ALL the pieces! And what an adorable way to celebrate your grandchildren! Madeline, I love the large-to-small display of this piece and the back is almost as pretty as the front. The photos of those precious kids put the front over the edge! Tis just so sweet and gorgeous! What a beautiful project. I did the same thing with mine! I guess great minds think a like. I love the colors and the smiley faces of your grandchildren. Happy Thanksgiving. Hi Madeline, happy Thanksgiving! Love your fun project, it's just beautiful and very clever. Thanks for sharing! So pretty and great idea on using all the pieces! This accordion frame album is to be cherished on view all year long. Mahalo for sharing a charming way to use this diecut. Love this project Madeline, so useful too! I love what you did with all of the frame pieces. How brilliantly clever!